Common sage is a herb with which most people are familiar, frequently used to enhance the flavours of other ingredients such as apples, onions, celery and cheese, and used in both its dried and fresh forms; but this common variety is only one member of a much larger and interesting family whose horticultural decorative qualities, in my opinion, supersede its culinary virtues. 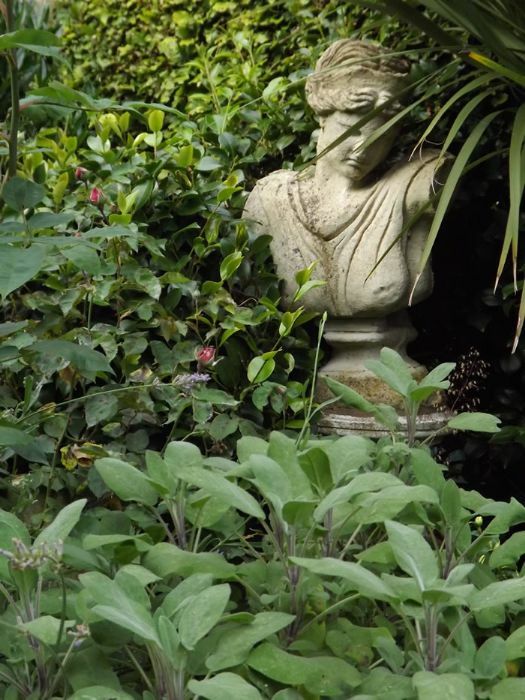 Most of the sages in our garden are grown in The Herb Garden. Some, however, are used to compliment surrounding plants and to offer out-of-season interest in the Rose Garden. Green- and purple-leaved varieties are primarily favoured so as to blend effortlessly into the predominantly pink and purple scheme. Salvia (sage) derives its name from the Latin “salvere” – to save, to feel well and healthy or to heal – referring to the herb’s potent healing and medicinal properties. 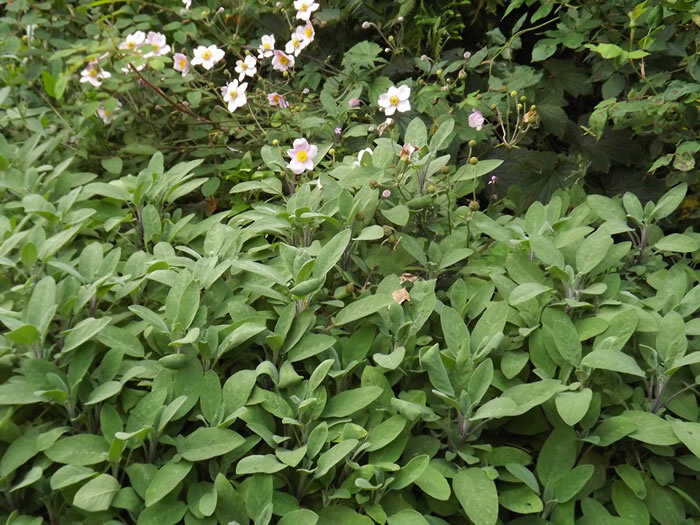 The ancient Greeks used it extensively and found it invaluable in treating ulcers, snake bites and consumption. The Romans held sage in even higher regard, considering it to be sacred. Used as a part of Roman ceremonies, a specially-made knife had to be employed because iron salts will react with sage, rendering the use of iron tools inadvisable. Around the 17th century, the Chinese were trading three chests of China tea to one of sage leaves – surely evidence of how highly revered and regarded the herb was held in this society at that time. The sages that are currently grown in the garden include an unusual variety – salvia elegans ‘Scarlet pineapple’ (rutilans). This pineapple sage finds its roots in a pot because it is half hardy and needs to be brought into a cool greenhouse in winter. As its name implies, its leaves release a wonderful scent of pineapple when rubbed. 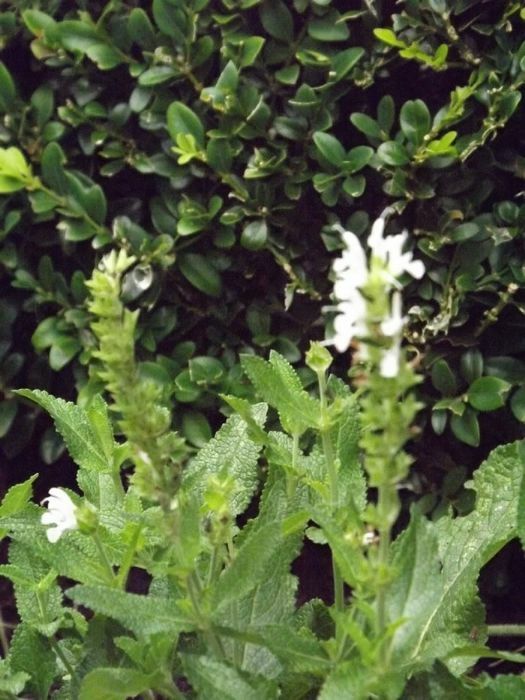 Salvia officinalis – common sage – is the best of the sages when it comes to culinary use. In summer, it produces subtle spires of blue flowers, offering the perfect softener for both the old roses and other herbs in the garden. 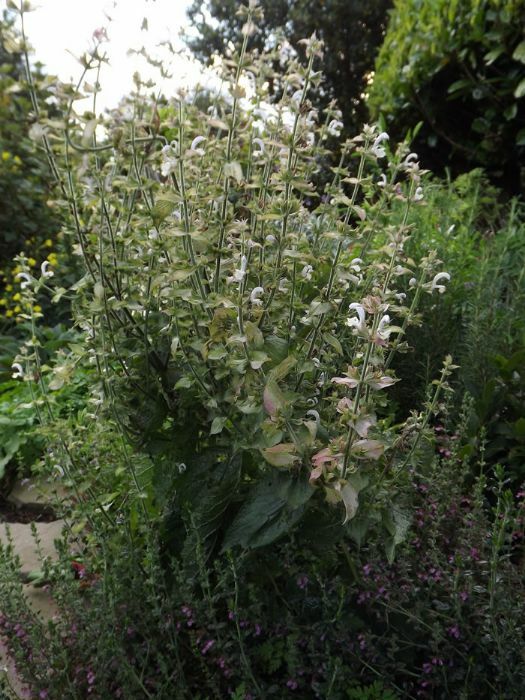 A rarer form of salvia officinalis – ‘Albiflora’ – is grown in the White Garden. At the moment, it is causing an obstruction to a very narrow path and will therefore be moved in the autumn to a better position, where it can grow to its full potential. The group known as Salvia officinalis purpurascens is another sage grown both in the Herb and in the Rose Gardens – its purple leaves forming the perfect foil over which pink and purple roses can spill. 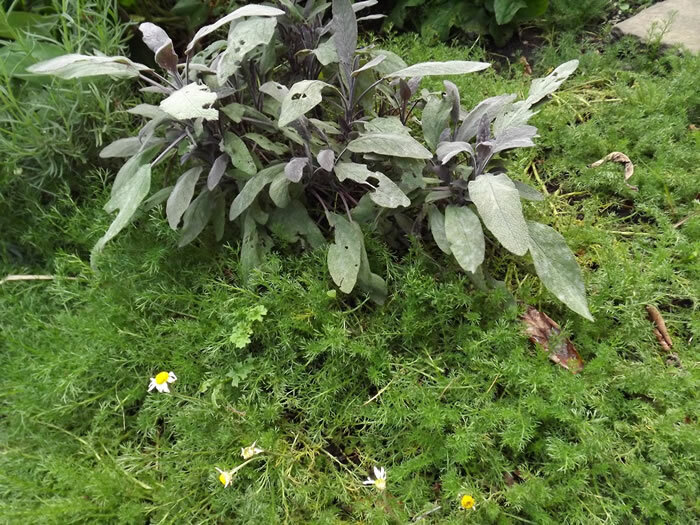 salvia officinalis purpurascens - woven around a carpet of camomile. 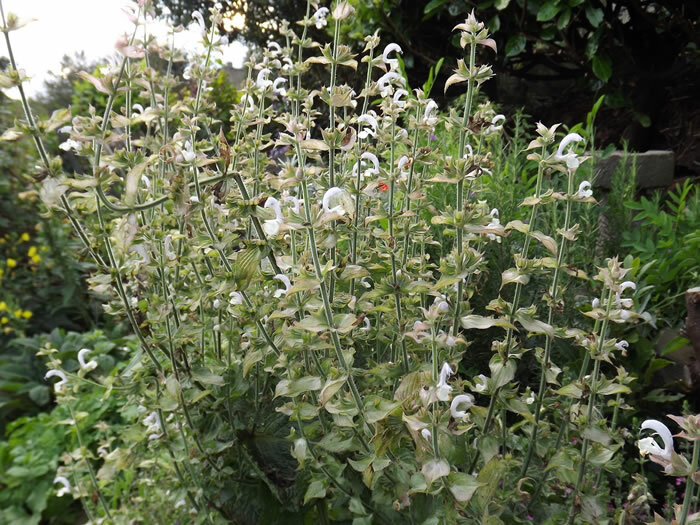 The slugs and snails appear to have taken a fancy to this sage and, I suppose, who can blame them? 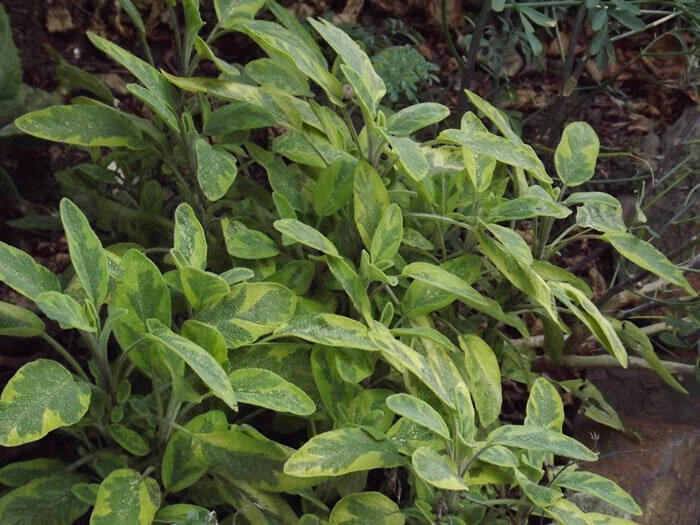 Salvia officinalis ‘Icterina’ Gold Sage is grown solely in the Herb Garden since its golden, variegated leaves would create too much of a clash with the colours in the Rose Garden. Where it is grown in the Herb Garden, with no set colour scheme to adhere to, it provides a pleasing colour contrast to surrounding herbs. Salvia officinalis ‘Tricolor’ is a half hardy sage in most regions, but in dry soil combined with the shelter of a warm hedge, it survives most winters in Golcar. Due to its purple, cream and green variegation, the ‘Tricolor’ too is restricted to the Herb Garden, and avoided in the Rose Garden, where its effect would be conflicting and hectic. Salvia sclarea ‘Clary Sage’ is grown as a hardy biennial – with wonderful flower bracts of blue, purple and lilac with a white base during the summer months. 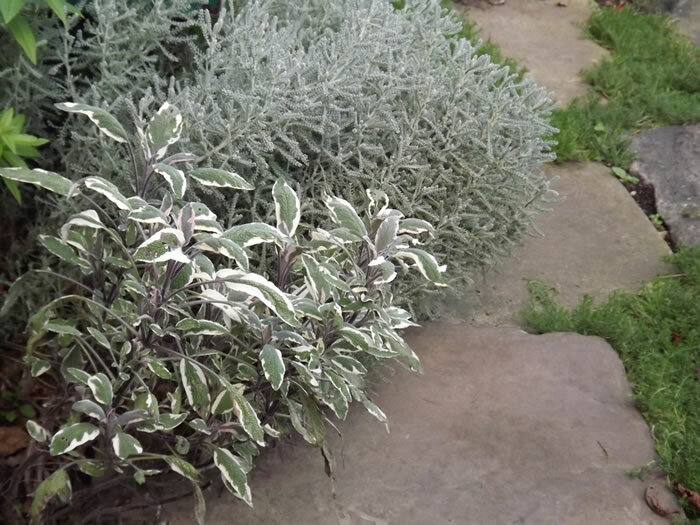 Lastly, another tender sage grown in a pot in the Herb Garden is blackcurrant sage ‘Salvia microphylla’. Rather predictably, but none-the-less amazing, its leaves release a sensational blackcurrant aroma. 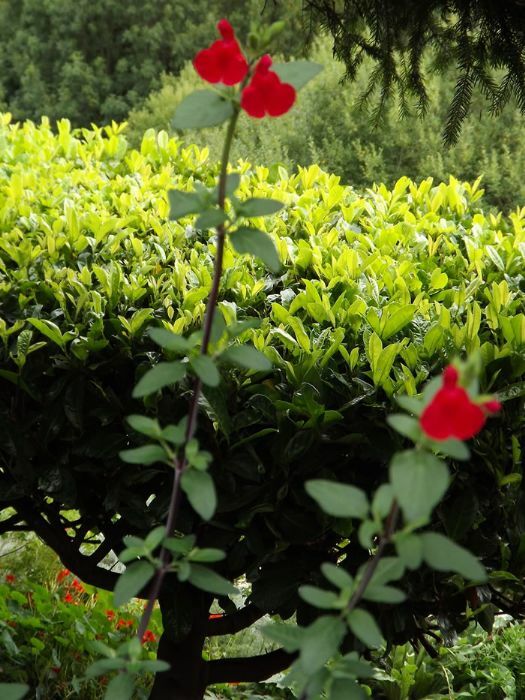 Visually, this herb has the added bonus of small, exquisite scarlet-red flowers.